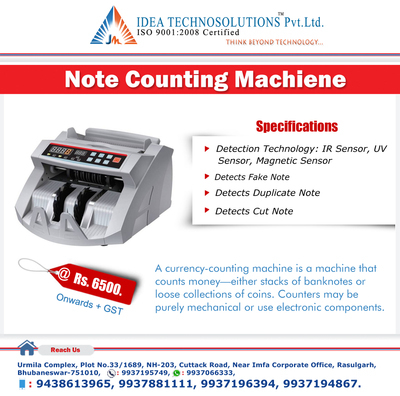 NOTE COUNTING MACHINE:--> Specification:-- Detection Technology: IR Sensor, UV Sensor, Magnetic Sensor Detects Fake Note Detects Duplicate Note Detects Cut Note A currency counting mnachine is a machine that count money either stacks of banknotes or loose collections of coiuns. Counter may be purely mechanical or use electronic componets. Urmila Complex, Plot No. 33/1689, NH-203, Cuttack Road, Near Imfa Corporate Office, Rasulgarh, Bhubaneswar-751010. Ph: -9937195749 Whatsapp - 9937066333 Mobile - 9937881111, 9937196394, 9937194867 Web URL - www.ideatechnosolutions.com.com . Email: info@ideatechnosolutions.com.